Part 1 Biobased food packaging materials: New directions: State-of-the-art biobased food packaging materials; Types, production and assessment of biobased food packaging materials; Thermoplastic nanobiocomposites for rigid and flexible food packaging applications; Improved fibre-based packaging for food applications; Starch-based edible films; The use of chitin and chitosan for food packaging applications. Part 2 Using environmentally compatible packaging technologies in the food industry: Consumer attitude to food packaging and the market for environmentally-compatible products; Environmental assessment of food packaging and advanced methods for choosing the correct materials; Measuring the environmental performance of food packaging: Life cycle assessment; Eco-design of food packaging materials; Additives for environmentally-compatible active food packaging; Recycling of food packaging materials: An overview; Recycled plastics for food applications: Improving safety and quality; Recycled paper and board for food applications: Improving safety and quality. Part 3 Environmentally compatible food packaging for particular applications: Overview of environmentally compatible polymeric materials for food packaging; Modified atmosphere packaging using environmentally compatible and active food packaging materials; Active environmentally compatible food packaging; Biobased intelligent food packaging; Environmentally compatible packaging of fresh agricultural and horticultural produce; Biobased packaging of dairy products; Environmentally friendly packaging of muscle foods; Legislation and certification of environmentally-compatible packaging in the EU. Food packaging performs an essential function, but packaging materials can have a negative impact on the environment. This collection reviews bio-based, biodegradable and recycled materials and their current and potential applications for food protection and preservation. The first part of the book looks at the latest advances in bio-based food packaging materials. Part two discusses the factors involved in choosing alternative packaging materials such as consumer preference, measuring the environmental performance of food packaging, eco-design, and the safety and quality of recycled materials. Part three contains chapters on the applications of environmentally-compatible materials in particular product sectors, including the packaging of fresh horticultural produce, dairy products and seafood. This section also covers active packaging, modified atmosphere packaging and biobased intelligent food packaging. The book finishes with a summary of the legislation and certification of environmentally-compatible packaging in the EU. 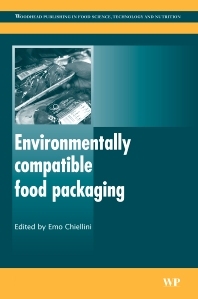 With its distinguished editor and contributors, Environmentally-compatible food packaging is a valuable reference tool for professionals in the food processing and packaging industries. Professor Emo Chiellini holds the Chair in Fundamentals of Chemical Technology in the Faculty of Engineering at the University of Pisa and leads the BIOlab Laboratory in the Department of Chemistry and Industrial Chemistry. He is widely-published in the areas of polymer science and technology and packaging materials.